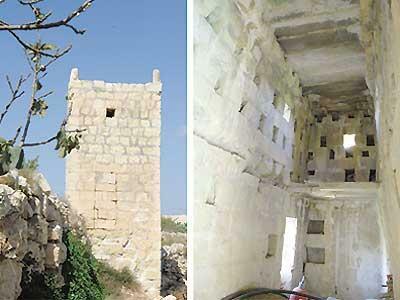 A dovecote that is at least 200 years old, lying close to the Speranza chapel in Mosta, is in danger of collapse unless restoration works are undertaken without delay. The dovecote - barumbara in Maltese, a corruption from the Italian columbara - was most probably some sort of agricultural room that was later converted into an apiary and dovecote. Dovecotes are a form of rural architecture that remain unstudied, so little is known about them. What makes this one unique is that the lower level housed terracotta jars where bees built their hives and produced honey while the top part on the first floor contained nesting holes for pigeons. The previous Mosta local council had obtained permission from the Malta Environment and Planning Authority to restore the building but problems arose because of land ownership. The land on which the dovecote is built was Church owned but had been passed on to the Joint Office. Now the land is rented to a private individual who cannot afford to restore the dovecote, but who would like to see it conserved. The council, however, cannot restore private property and can only embark on the project if the dovecote is passed on to it. The Times has been told that a way to carry out the restoration would be to find a sponsor and restore it in conjunction with Din l-Art Helwa. Dovecotes were an important source of meat for country folk at times when meat was scarce. During the times of the knights of the Order of St John, the building of barumbari was encouraged and heavy penalties were envisaged for anyone caught disturbing dovecotes or trying to steal from them. Barumbari were a most economical way of procuring meat because all one needed to do was to provide water and pigeons with a nesting site. The birds came and went at will and fed on someone else's land. The adult birds were left to breed and it was the tender chicks that were taken for food just before they fledged. In a number of dovecotes, one finds several rows of pigeon holes. Large dovecotes had in excess of 100 nesting holes. These gave a steady supply of meat as pigeons breed practically all year round. Although dovecote owners had a steady supply of pigeons, they did not feast on them. The chicks were cooked in broth and the meat used in tarts and stews, often accompanied with bread or pasta.